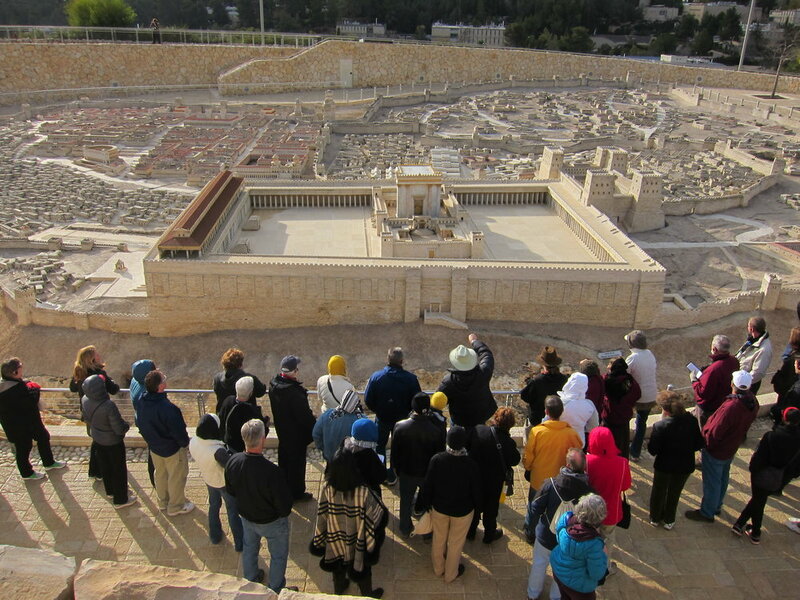 Our annual pilgrimage to the Holy Land, January 7-20, 2013, is at capacity and we are on a waitlist basis now. Contact Bonnie Lane 952-474-0903, goldeneagletraveltours@msn.com to see if there have been any cancellations. Daily mass at holy sites like Church of the Holy Sepulchre, St. Peter's in Capernaum & Annunciation in Nazareth! Praying a decade of the rosary on locations where the mysteries happened! Individual audio transmitters so you can hear it all! Our pilgrimages are inspirational and educational as well as opportunities for spiritual growth, making new friends and just having fun! Jeff & Emily CavinsYour hosts, Jeff and Emily Cavins, who have led dozens of pilgrimages together, are eager to show you the wonders of the Holy Land. Jeff will be the main bible teacher at key locations and Emily will add her archeological insights at several sites. Emily has written a "Pilgrim's Guide to the Holy Sepulchre and Golgotha in Jerusalem" which will be shared with those who accompany the pilgrimage. Students of Jeff's Great Adventure Bible Studies have found these pilgrimages deeply enriched their understanding of the bible. Fr. Mike Schmitz from the Diocese of Duluth, MN will be the spiritual director for this pilgrimage. Fr. Mike has served on several pilgrimages and brings his enthusiasm for the Catholic faith through his inspirational homilies and his love for people. Jackie is a singer, songwriter, guitarist, speaker, and youth minister from Placentia, CA. For 22 years Jackie attended St. Joseph Catholic Church in Placentia. Through retreats, youth conferences, and World Youth Day 2000 in Rome, Jackie experienced Jesus in a deeper way. In 2006, she served as the youth minister at Our Lady of the Assumption Catholic Church in Ventura, CA. In 2007, Jackie moved back to Placentia to begin full time music ministry, serving the wider Catholic Church. Jackie is currently a host for spiritandsong.com's webcast, "The Commons," and for spiritandsong.com's Perfect Playlist Podcasts. Her debut album,Your Kingdom Is Glorious, was released through spiritandsong.com in 2008. Mark & Sarah ChristmyerSarah Christmyer, co-author of the Great Adventure Bible Studies and her husband Mark will join us with several members of their local parish, St. Norbert's, in Paoli, PA. Mark will serve as the site logistics coordinator and Internet communcations coordinator. Fr. Michael LeeFather Michael Lee, O.Praem., is a member of the Norbertine community at the Daylesford Priory located in Paoli, PA. Fr. Lee has been a high school educator, principal and President of Bishop John Neumann High School in Philadelphia and, for the last 20 years, a parish priest serving the Archdiocese of Philadelphia first in Center City Philadelphia as pastor at St. Gabriel Parish (where he was born and raised) and currently pastor at St. Norbert Parish in Paoli. Fr. Mike is a world traveler having visited many countries and religious sites around the world including Europe, Machu Picchu, Egypt and Mt. Sinai, Tibet and China but never Israel and the Holy Lands which he is looking forward to experiencing. Here is what some of our recent pilgrims have said about our pilgrimages! Please feel free to contact us at Cavins Tours phone number --763-420-1074.